Tri-Metal, Unisex, Magnetic Copper Bracelet. Plain, Simple, Sober and Elegant, This Magnetic Bracelet is Equally Well Suited for Men or Women. Contrary to Most Copper Bracelets, This Model Won't Stain Your Wrist Because It Has an Electroplated 24K Gold Coat on it. Be Squeezed Closed to Fit Smaller Wrist Sizes. Tend to Pick Up Shadows and Light From All Angles. They Also Tend to Reflect Their Own Colors onto Each Other. I Couldn't Get a Photo Without Shadows or Reflections! 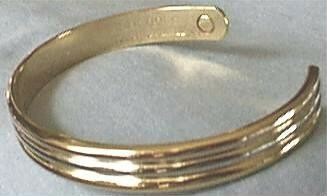 The Bracelet is Equally Well Finished on The Inside as well as the Outside and Completed With Two Recessed Magnets to Attract More of the Iron in Your Blood to the Wrist Area. On the Inside are Also Found the "24K Gold Electroplated" and the "XL" Engraved Marks. Normally Found in Precious Jewelry. Economical, Stylish, Therapeutic and Elegant, This is the Perfect Companion to Golfers, Tennis Players, Typists, Fishermen, Foosers and Anyone Who Suffers from Aches and Pains Caused by Repetitive Movements. The Magnets are Approx. 3/16" Wide and are Also Electroplated in 24K Gold. Made in China to US Specifications. See Our Other Listings for Matching Ring.